In terms of application, the global electric heat tracing systems market has been divided into process temperature maintenance, hot water temperature maintenance, floor heating, and freezing protection. Of these, the process temperature maintenance segment is expected to dominate the market owing to the increase in demand for electric heat tracing systems in the industrial sector to meet the ever-rising requirements in quality, accuracy, energy saving, and safety. This, in turn, has propelled the demand for electric heat tracing systems for applications such as process temperature maintenance, tank & vessel heating, and pipeline heating in the industrial sector. In terms of end-user, the global electric heat tracing systems market has been segregated into industrial, commercial, and residential. The industrial segment dominated the electric heat tracing systems market in 2016. This trend is anticipated to continue during the forecast period. Furthermore, the segment is estimated to be highly attractive during the forecast period. It is projected to expand at a CAGR of more than 4.0% between 2017 and 2025. The industrial segment is likely to be followed by the residential segment in terms of growth rate during the forecast period. Based on geography, the global electric heat tracing systems market has been classified into Latin America, North America, Asia Pacific, Europe, and Middle East & Africa. 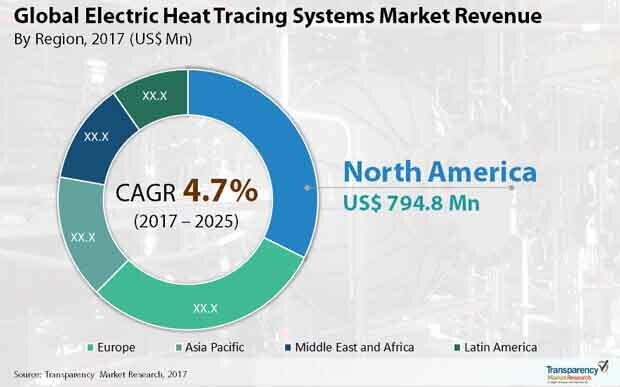 The electric heat tracing systems market in North America is expected to expand at a CAGR of more than 5.0% during the forecast period owing to the constant demand and usage of electric heat tracing systems in various end-use sectors across the region. The U.S. is the leading manufacturer and consumer of electric heat tracing systems in North America. Furthermore, manufacturers in the region are taking advantage of the increase in disposable income. They are offering various products that can be used in commercial as well as residential sectors.